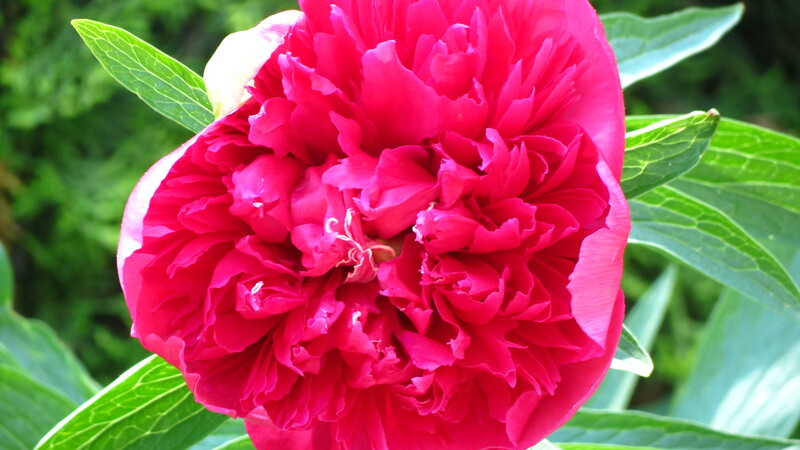 For many gardeners, the reasons for gardening come down to stimulating and satisfying our own senses: the scent of a summer rose, the feel of a freshly mowed lawn under your toes, the sound of morning songbirds, the taste of a homegrown tomato, or the sight of the saturated color of the season’s first peony bloom. But are our senses the only ones being stirred in the garden? According to a remarkable video and an equally remarkable book, the answer is “no.” Our senses, it seems, are in good company with the senses of our plants. About a year ago, I discovered a Smithsonian Channel video, which is now available on YouTube. Although the video was educational, I could never figure out how to say what I wanted to say or how to use it in a way that would make sense. What I do know is that the video has remained in my brain and at the top of my post wish list. See what I mean? Very cool stuff. A few weeks ago, my father phoned me and told me to watch “CBS Sunday Morning,” and an interview with biologist/author Daniel Chamovitz. In easy-to-understand language, he explained that human senses are not the only ones stirring in the garden. In a sense, said Chamovitz, plants have their own “senses” that are not too different from our own — and it’s not nonsense. It’s science. Chamovitz’s ideas are more deeply explored in his newly published What A Plant Knows: A Field Guide to the Senses, a well-researched book that is informative, intelligent, educational, and very user friendly — a kind of Sense and Sense-ability for gardeners. As a postdoctoral fellow at Yale University, Chamovitz was drawn to the idea of how plants use light — and his scientific questioning led to the discovery of a specific set of genes that enable a plant to determine if it’s in the light or in the dark. Much to his surprise, these genes are also a part of human DNA. The discovery began a lifetime of questions and research into the similarities between plants and humans. The result is this book, which is as much a tribute to the wonders of plants as it is to the wonders of the scientific process. 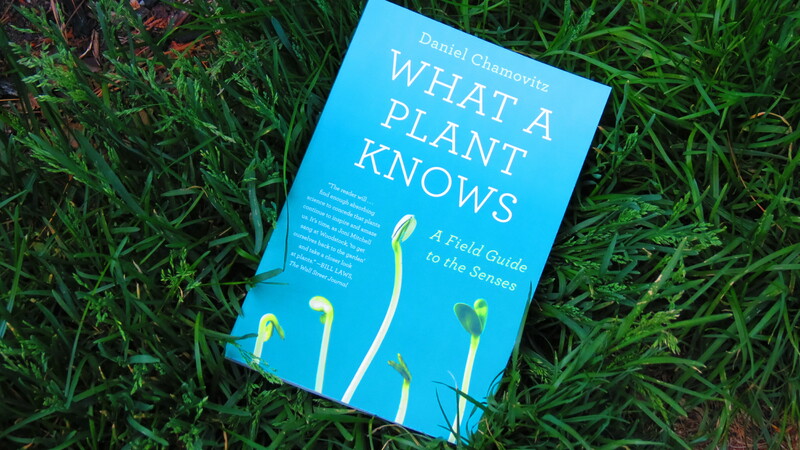 Chamovitz devotes each chapter to a specific sense, with his words peeling away the mystery of why plants do what they do. To illustrate, Chamovitz recalls the work of earlier researchers and their discoveries, as well as the behavior of specific plants — such as Cuscuta pentagona. More commonly known as dodder, the plant is a parasitic vine without chlorophyll. In order to survive, it “smells” for a host plant and actively grows toward the source of the aroma. Yes, this is that kind of book. It will make you sit up and say, “Wow!” It will make you ask questions. It will make you appreciate even more the wonder that you cultivate in your gardens. I can hear you all saying, “If plant can do all this, what else can they do? Talk?” Well, yes, they can. Cue the video, also from the Smithsonian Channel. If you would like to win a soft cover copy of What A Plant Knows: A Field Guide to the Senses, please leave a comment below. For a second chance to win, leave a comment on my Facebook page and please remember to click “Like.” Winners will be announced on Saturday, May 25. I’d like to know what a plant knows! For some plants, only the nose knows. Sounds like a fascinating read. Interesting the idea of a parasitic plant finding its host. It’s got to mount a lot of duds to be anywhere close to just the right tree. Hey Patrick. From what gather, the dodder plant, if planted alone, will die. If near other plants, it actively seeks out the host — and it has the ability to discern what it likes. Tomato plants are a favorite. There’s a lot to this book — and you’re right, it’s fascinating. This sounds like such a interesting read. If I don’t win it I am going to hunt a copy down! Hi Jerianne. It’s a great read — and both wondrous and scary to learn what plants do. Always like a good read and will look out for this one. I can say that plants you buy from garden centers clearance beds always grow better than others at full price. Do you think they know its their last chance and reward you for buying them? I think they know more than we do. Sounds like something I want to know. I love plants and talk to them daily. I. Know, kinda weird!! But it makes me happy. Not weird at all, Karen. We talk to our plants, care for them, nurture them along — and if it makes us happy, then it’s worth it. Count me in on the book drawing! Count me in. I’d love to know more about this. Thanks for the review and links. I always tell my friends plants do have feelings! Hi Vickie. Plants not only have feelings – they also smell trouble coming! I just finished Animal Wise by Virginia Morell, which discusses the cognitive and emotional abilities of various species–from ants to chimpanzees. It’s certainly intriguing to know that we’re not alone in our thoughts and senses and this Chamovitz book seems like the perfect companion to Animal Wise. Very timely of you. Hi Graydon. I think the hardest part to wrap my head around was the idea that plants — without brains and a nervous system — are able to interact with their environment with senses. The idea that some of their genes are part of human DNA truly feels as if we are all one. Love this post, Kevin. I’ve always thought plants have feelings and NOW they’re talking! 🙂 All the best! LOL … They better be saying nice things! Another great book review! Kevin you always make me interested in reading more. Thank you! 🙂 Too funny. I agree about the Smithsonian Channel — I have an app on my iPad for it. Lots of interesting stuff. It’s always a tug of war between that and TED. Sooooooooooo all my conversations were not one sided! This is really fascinating. One thing that comes to mind is how the studies support the connection between all living things. Just because I can’t completely understand it doesn’t negate the evidence. The ether study is mind blowing. I really can’t fathom that. So glad you shared this Kevin, and glad I didn’t miss it. My WP reader has been so upside down for a few days, I’m only now finding the weekend posts I never saw the first time. LOL! I really like science, so this was very interesting. I can see why you couldn’t forget about it! Chamovitz’s book looks like a winner (and lots of reviewers seem to agree). Thanks for the chance to win a copy! Hi Kevin, I got here too late for the giveaway, but this sounds like a wonderful book. I’ve added it to my wish list and just want to thank you for bringing it to my attention. Hi Jean. Sorry you missed the giveaway, but I know this is a book that will fascinate you. Enjoy!